Spring Cleaning For Your Skin! Give Your Skin a Springtime Treat With Our New AA Skincare Essentials Range. - Amphora Aromatics Ltd – Supplier of pure essential oils and aromatherapy Products. and how you can get your skin ready for Spring using the new range of Natural Cleansers, Toners, Moisturisers and other gorgeous products from Amphora Aromatics. Spring time is one of my favourite times of year: the days begin to get longer, temperatures a little warmer, beautiful spring flowers start to bloom – it’s a time when we can start saying goodbye to those dark, cold days and hello to glorious sunshine. Now is the perfect time to pamper your skin so it looks and feels nourished again. Winter temperatures outside and dry heating indoors can leave our skin feeling dehydrated, dry and rough and in much need of some TLC. With our new, naturally effective, AA Skincare Essentials range of 28 new aromatherapy creams, gels, cleansers, moisturising lotions and skincare products, there has never been a better time to give your skin a treat. One of the most common skin conditions that occurs over winter is dry, flaky skin, here are a few easy to follow steps for a lovely skin hydrating, at home facial you can do yourself. Our new Sandalwood and Palmarosa cleansing gel is a beautifully moisturising and hydrating cleanser packed full of skin loving ingredients. 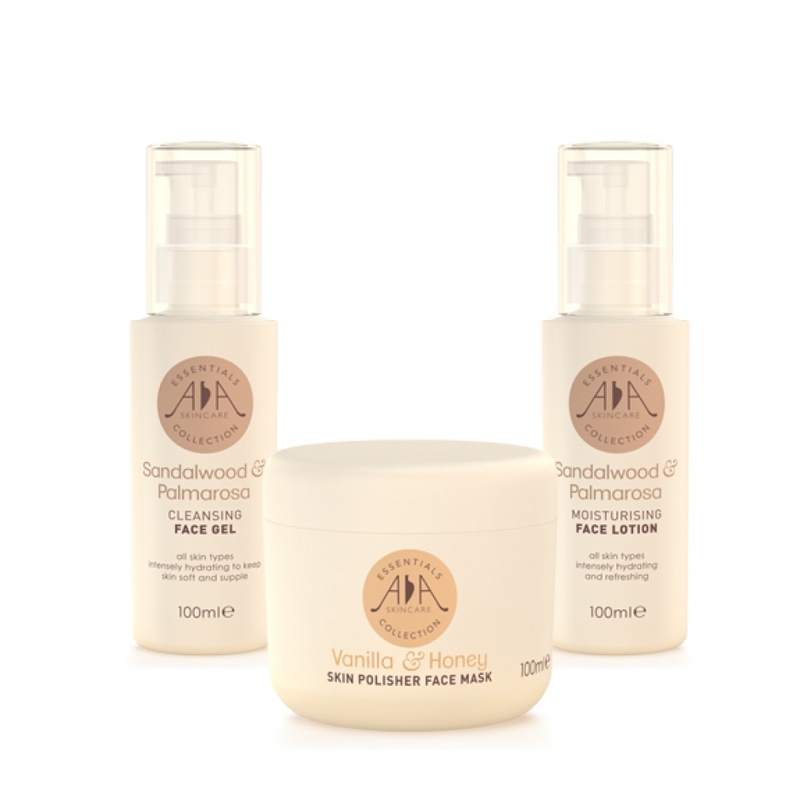 Sandalwood Essential Oil helps hydrate and calm skin as well as tone. Palmarosa Essential Oil has great rejuvenating and regenerating properties which help skin repair and encourages healthy cell growth. Other fabulous ingredients include Rosehip Seed Oil, Lavender Essential Oil and Grapeseed Oil. Dampen your skin with warm water then pump a small amount of the cleanser into the palm of your hands. Gently massage the cleanser into your skin using a circular motion, concentrating on any areas that feel like they need a little extra attention, then rinse with warm water. Your skin will benefit from a deep cleansing weekly face mask treatment. Our new Vanilla & Honey Skin Polisher Face Mask not only smells divine but is packed full of Vitamin B and Antioxidants to help nourish and condition your skin, leaving it feeling wonderfully soft, hydrated and smooth. To use, apply the mask with your fingertips onto damp skin after cleansing and leave for five to ten minutes. Why not grab your favourite magazine or simply sit back, close your eyes and enjoy some peace and quiet while the mask gets to work. Rinse the mask off using warm water or a face cloth. With winter on the way out and temperatures beginning to rise, you may find applying a heavy day cream to protect skin from the elements is not necessary. Our new range of moisturising lotions are the perfect choice for a lighter, day time moisturiser. The Sandalwood and Palmarosa Lotion is intensely moisturising and hydrating and works perfectly with the cleansing gel, helping to repair and heal your skin. Simply apply a small amount to your fingertips and massage into skin. These three steps are super easy to do at home and will really give your skin a boost after the winter months. Thank you for reading, to find out more about our fabulous new AA Skincare range click here. Next time I will be talking about which of our new products you can use at home in the same way for oilier, blemished prone skin.